The ultimate roller garage door opener. SilentDrive BBU will ensure that you're able to get in or our of your garage safely in the even when there's a power failure. Don't let a power outage lock you out of your garage. With an Evercharge battery backup system you can always operate your door - even when there has been a power failure. With a 13 second opening speed* the fast operation minimises any waiting time. Combined with soft start and stop function, a powerful DC motor and adaptive technology inside the Silent Drive, you can be sure it will work in harmony with your domestic roller door no matter what size or brand. Driving into a dark garage and turning off your headlights can be a very dark experience! The Silent Drive with its 12 LEDs provides, energy efficient light that automatically switches on when the door is activated and switches off after 2½ minutes. Up to 75% less standby energy. 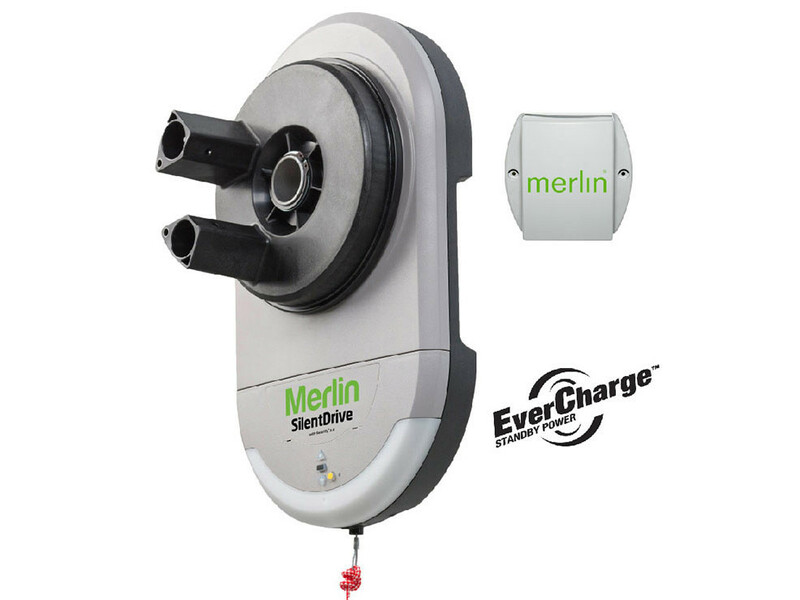 The advanced electronic design in the Silent Drive uses less than 1 watt of electricity when in standby mode meeting some of the world's toughest energy saving standards and saving you money. Silent Drive’s powerful and fast DC motor is quiet and built to last. It has the strength to open any size of domestic door. You don’t have to question Silent Drive, it is the perfect choice! Tested in side by side comparisons# the Merlin Silent Drive has up to 18% better range. Which means it is not only more reliable, you can also start opening your garage door sooner. #Comparison to major brands. Automatic power adjustment and electronic mapping of the door means Silent Drive adapts to the change in door spring and hinge operation that naturally occurs with varying weather conditions and age. This technology means less maintenance and trouble free, reliable operation for years to come as the opener adapts to the door every time it is activated. Security+2.0 technology inside the remote is designed to communicate on multiple frequencies with the latest Security+2.0 encrypted rolling code. This enhanced radio technology will select the strongest frequency every time, virtually eliminating interference from other devices. It also provides the highest level of security available by using a unique code every time the button is pressed. The motor is excellent, I especially like the push button remote that can be temporarily pinned for deliveries. Very satisfied.